Lord British Presents... A Countdown! 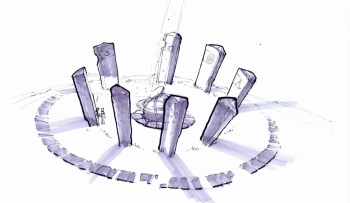 What could the man behind the famous Ultima RPG franchise be up to? "What waits beyond for Lord British?" Lord British tweeted earlier this afternoon. "Lord British," if you don't know - and shame on you, sir! - is the alter ego of Richard Garriott, the man who created Ultima, one of the preeminent RPG series of the 1980s and 90s. Tiring of the adventures of the Avatar, he became "General British" at the head of the disastrous Tabula Rasa MMO, and then he went into space. His return to gaming saw him move into the casual realm with Portalarium, which teamed up with Zynga to release Ultimate Collector late last year and then promptly laid off staff. Now he appears to be moving on to something more in line with what gamers really want from him. With a simple message on Twitter, Garriott revealed the "Lord British Presents" website, which, I hate to say, sports an option to sign up for "breaking emails" and a countdown, which thankfully has less than seven days on the clock. There's nothing revelatory in the page source, which means it's up to us to speculate. I'm pulling hard for a new Ultima Underworld, which by the dictates of the laws of the universe means it cannot possibly be a new Ultima Underworld; a new Ultima Online, perhaps? A brand-new, full-on Ultima RPG? Or - and I hate to say this, too, for fear of making it come true - an Ultima Facebook game? The great likelihood is that it will be the big reveal of the Ultimate RPG Garriott talked about in December 2011, which he said could become Ultima Online 2 if Electronic Arts signs on. Discussions about EA's participation were underway at the time and while nothing about it has been said since, it's probably worth noting that the text on the website is written in the old Ultima font.